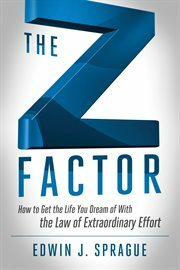 The item The Z factor : how to get the life you dream of with the law of extraordinary effort, (ebook) represents a specific, individual, material embodiment of a distinct intellectual or artistic creation found in Charlotte Mecklenburg Library. "When I grow up I wanna be a musician, an NFL quarterback, a CEO, a<U+0085>" How's that childhood dream working out? Most of us learn to discard our "outlandish" childhood dreams as we mature. It's part of growing up, right? No, you can still sell millions of your invention, be a company president, become an author, or sign an NFL contract-anything, anytime, regardless of your experience or education. Edwin J. Sprague has...in fact, he's done them all! Unlike the Law of Attraction, The Z Factor is anything but elusive or indescribable. "Z" is the extraordinary effort ordinary people can generate to turn dreams into reality. Is it time to finally be what you dreamt you'd be when you grew up? If so, it's time to harness the absolute power of Z. No affirmations here-just humorous, motivating, and gritty stories about: Why too much learning can kill your dreams, and how Tactical Ignorance keeps them alive. Raising your ZQ (ballsy [ball-zee] quotient) and introducing your ideas to life's realities. A Perpetual Motion Machine and the 10 tactics that'll take you to the next level-repeatedly Landing a whale (QVC), Feeding the Tuna Mayo, N.Y. Jets Meat, Professor Backwards, It Ain't Easy Being Seven at My Age... and much more!